If you’ve been reading my blog for a while now, you would know how much I love sweet potatoes. (As evidenced here, here and here.) I love the soft texture it takes on when it is roasted well and the flavor, to me, is as comforting as chicken noodle soup. So when one of my favorite bloggers posted a video about “perfect sweet potatoes”, I had to give it a try. 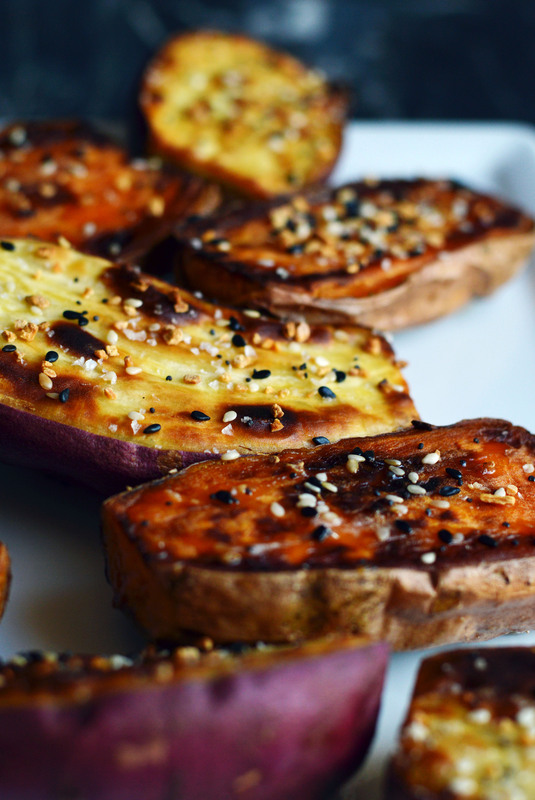 Aimee’s way of roasting the sweet potatoes gives it a crisp exterior and a smooth and buttery interior, and the addition of the “everything but the bagel” seasoning gives a savory edge to the sweetness of the sweet potato. We’ve been making these a lot in our house lately because it is Whole 30 friendly. My sister has been on the whole 30 diet and turns out no sugar, alcohol, grains, legumes, soy, and dairy really cuts down the things that you are allowed to eat. But this has been the sweet-savory snack that has been helping her stay on track. You can watch the video of Aimee making it here. Preheat oven to 400˚F and line a baking sheet with aluminum foil (shiny side down). Thoroughly wash your sweet potatoes. Trim both ends and cut lengthwise. 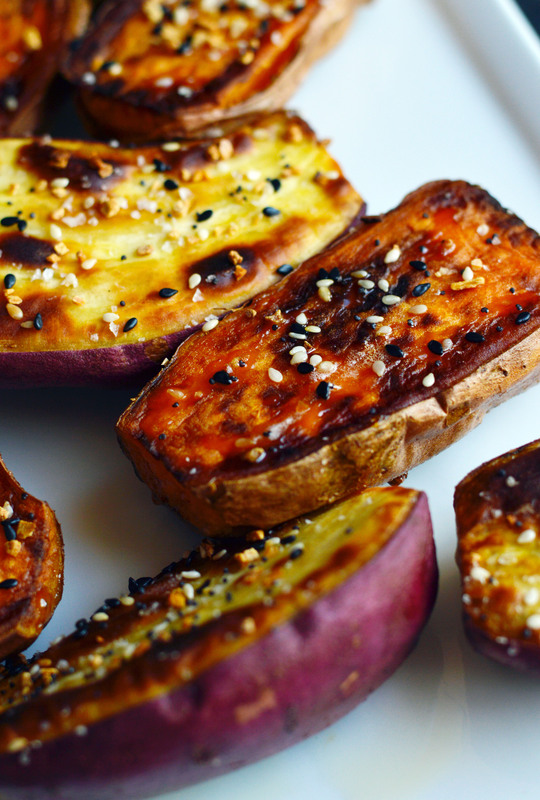 Coat the sweet potatoes with avocado oil, and place on baking sheet cut-side down. 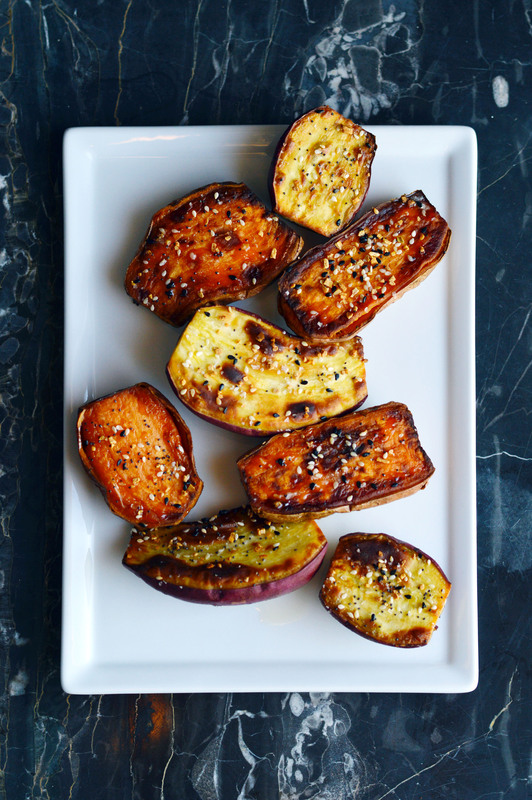 Roast sweet potatoes 15-20 minutes or until golden brown. Remove sweet potatoes from oven; flip sweet potatoes so they are cut-side up. Sprinkle with kosher salt, bagel seasoning, and garlic (if using). Move baking sheet back into the oven and roast 10-15 minutes more. 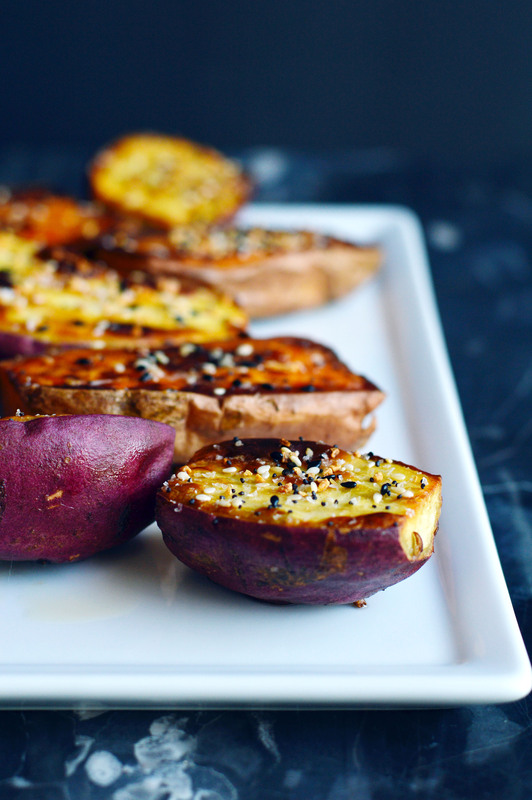 Turn off oven and let sweet potatoes sit in oven for an additional 10-15 minutes. Recipe adapted from Song of Style. This entry was posted in Appetizers, Simple Sundays, sweet potato, Vegetables and tagged easy cooking, everything but the bagel seasoning, sides, snacks, sweet potato, vegetables. Bookmark the permalink.